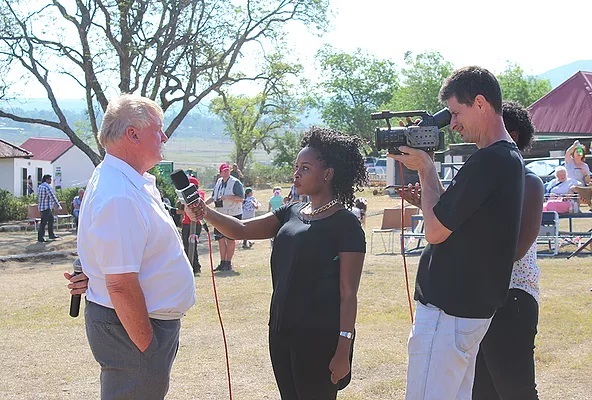 Nomad Africa magazine, one of Africa’s fastest growing publications, recently partnered with Talana Museum to celebrate the Battle of Talana Hill, hosted yearly by the Talana Museum in Dundee, Kwa-Zulu Natal, South Africa. 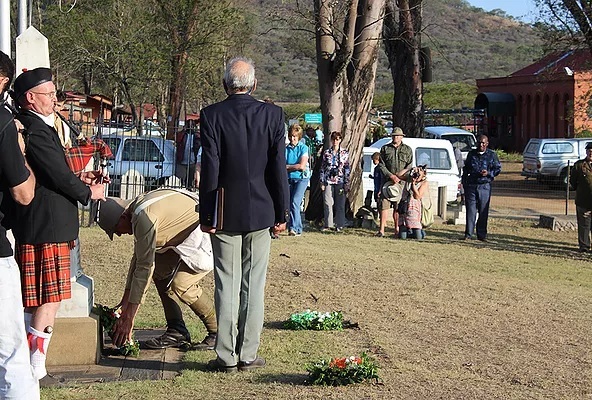 The celebrations were held from 16 to 18 October, attracting scores of tourists, cultural enthusiasts, historians, Boer War experts and locals who offered their devotion and support, to the commemoration of the Battle of Talana that occurred on the 20th of October 1899. Nomad Africa Magazine is elegant, luxurious, pan-Africanist, targeting the tourism, travel, social, political, cultural and business fields prevailing in Africa. Its mission is to tell the currently applicable, positive story of Africa and this occasion at Talana was very relevant allowing Nomad Africa Magazine to record and report of the Museum’s weekend program and the reenactment of the Battle of Talana Hill South Africa, like the rest of Africa has a history steeped in misinformation and exaggerations, hence the opportunity for Nomad Africa Magazine to retell it with pride, and from an African perspective. Throughout the three day event, large crowds keenly participated in the proceedings or followed the ongoing events with undisguised enthusiasm, indicating how much South Africans as well as international visitors held dear to their hearts, that part of the history that also influenced the road, which led to our Country’s independence and freedom. This human element resonated with Talana Museum’s watchword of being “The place to be seen” and “One of the best museums in South Africa”. The museum is the winner of this year’s Tripadvisor Certificate of Excellence. 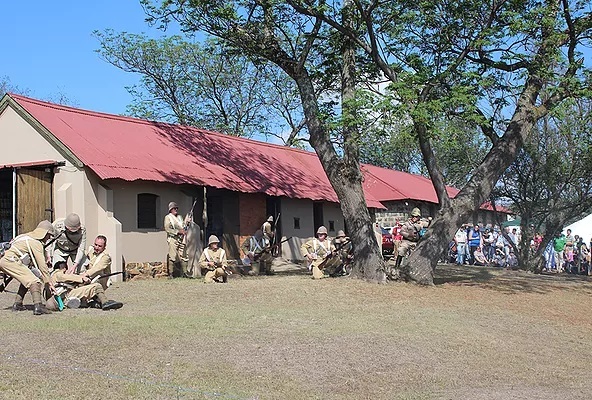 All year round throngs of visitors to the museum brave the African sun on Talana Battlefield, in northern Kwa-Zulu Natal, where the sounds of guns rang out a long time ago, marking the beginning of the first major battle of the Anglo Boer war. The Anglo Boer War was not merely another war in South Africa’s tapestry of conflict, but a major event that left a lasting legacy on our nation’s modern history. It is this and other events that form our legacy which Nomad Africa Magazine exposes across Africa in a bid to inform the World how things were in the past and how they are now. Nomad Africa Magazine’s journalists sampled all the museum’s offerings, including self guided historical hiking trails across the battlefield and up Talana Hill to the remains of the gun emplacements, the Boer cannon road and British forts on the top of the hill. 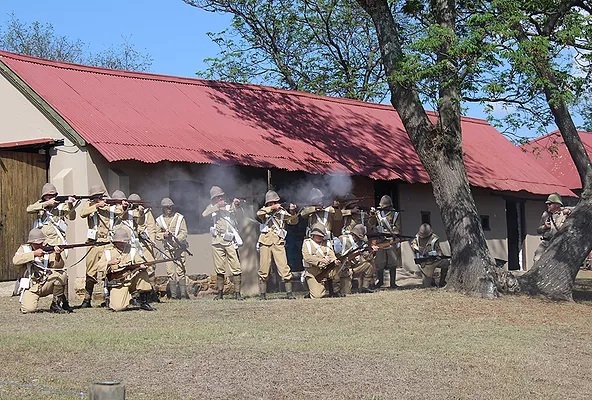 The editorial team witnessed a re-enactment of the battle of Talana, and marveled at the museum’s all-inclusive historical records, wherein credit is given to all the brave people, men and women of all races, who lost their lives in this conflict which influenced South Africa in its aftermath. This has been accentuated by the erection in 1999 of a Memorial Wall of Peace and Reconciliation, to commemorate the centenary of the 2nd Anglo Boer War. A programme called ‘Night at the Museum’ (excluding Adam Sandler and his dinosaurs), availed time with story-telling of ‘ghosts’ gone by and to experiences of life in the Boer, British and even Voortrekker camps as well as rides in ‘Ghost Trains’. Piping the lament as officials parade through the town of Dundee led by Pipe Band, re-enactors, cultural groups, cars and motor cycles to start this year’s Talana live event. 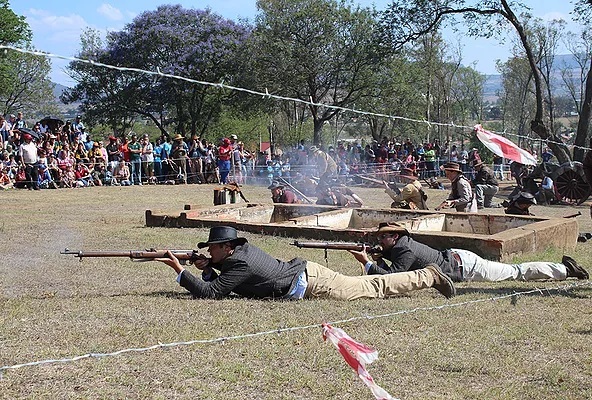 British soldiers fire gun shots at Boer soldiers as participating crowd watch with keen interest during the re-enactment of the battle of Talana. Boer soldiers carrying a fellow wounded soldier to the armory during the re-enactment of the battle of Talana. 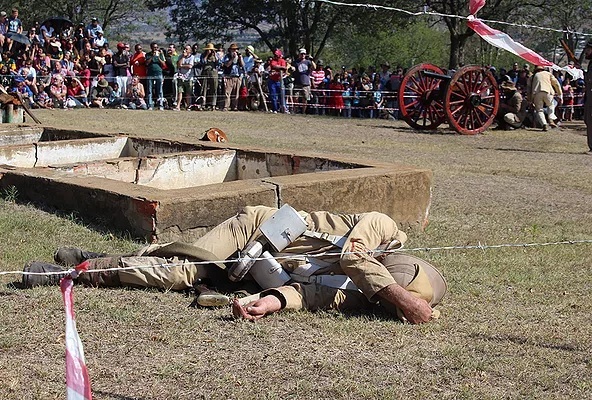 A dead Boer soldier during the re-enactment of the battle of Talana. Participating crowd watch with keen interest. 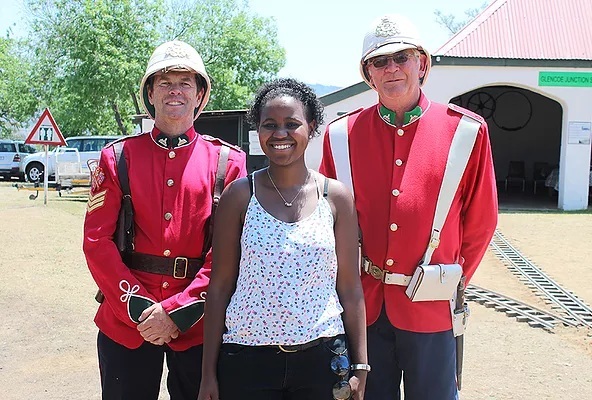 Nomad Africa Magazine journalist, Jane Sikwe, poses with two British red coat soldiers at the event. NomadTV crew interviewing one of the organizing officials of the 2015 Talana live event. A priest coordinating proceedings at the Talana cemetery down the slopes of Talana battle hill. Monuments in the cemetery commemorate all three regiments, which fought at Talana. 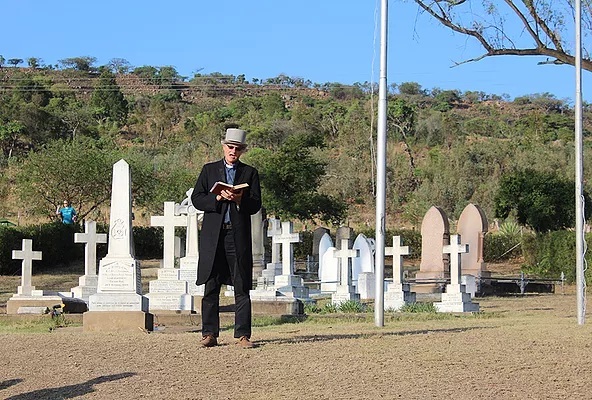 Piping the lament and lowering of flags at the Talana cemetery as a Boer soldier places red roses in honour of the fallen heroes of the Talana Battle. NomadTV presenter, Elizabeth Mojabeng and Nomad Africa Magazine journalist, Jane Sikwe poses with the Curator of the Talana Museum, Pam MacFadden at the event. 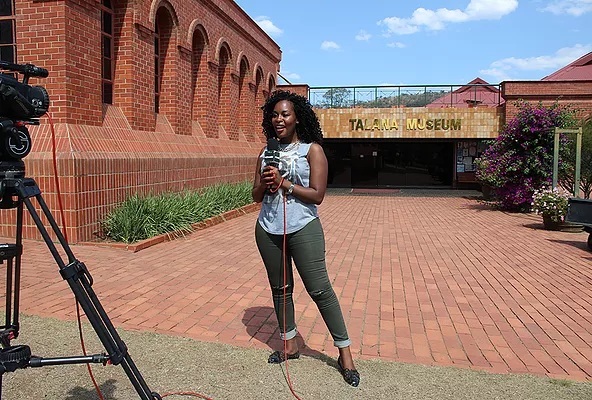 NomadTV presenter in front of the Talana Museum. Cultural pavilions covered Zulu, Indian and German aspects of customs and traditions, food, dance, clothing and markets, many supported by demonstrations as well as historical talks. Very interesting was The Mine Workers March which apprised visitors of this unique part of our history, as they walked 2km to the museum with commentary along the way relating to the march undertaken by the Zulu mine workers, from Johannesburg to Hattingspruit in Natal in 1899. “A good museum which welcomes visitors with no axe to grind on local history (and there are a lot of axes around). The Anglo Boer War is a bit of history which changed a lot in Britain. The museum allows you to come to your own conclusions about British scorched earth policy, and one of the first comprehensive use of concentration camps. The early disastrous performance of the British army led to major changes in organization and tactics. It also left deep bruises in SA which were unfortunately exploited by the Apartheid government, which obscured their deeper meaning. Talana museum helps one through this maze.” Brilliant! Talana Museum has raised the bar very high by curating an all-embracing African spectacle, which is actual homage to the Nomad Africa magazine’s birth. A display that deserves all the publicity we can muster to help dispel the negative perceptions which the world has held of Africa, and to replace it with positive insight. Nomad Africa magazine’s invitation to this event by Talana Museum, is testament to our increasing and valuable contribution to the retelling of the African story to the outside world. 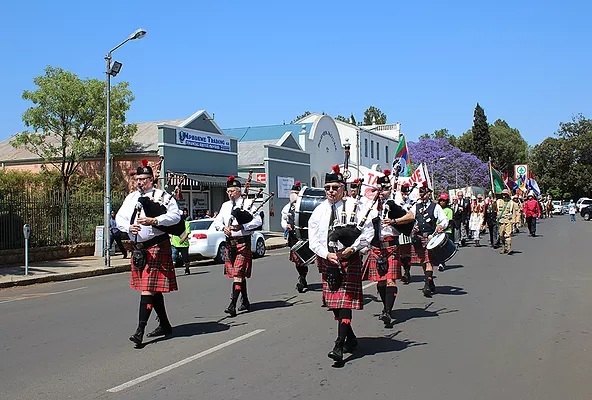 On the other hand, Talana Museum is a repository of South Africa’s most valuable histories, that we find it appropriate to have been involved in this year’s celebrations here in Dundee,” said Associate Publisher Dieter Gottert. Feature Editor Freddie Erasmus echoed, that the occasion was an opportunity to witness, not only the re-enactment of the South African history that was specially programmed for the present, but also to go back in time by touring the Museum’s sites, which are so rich in detail of our country but the rest of Africa. Nomad Africa magazine is looking for partners and investors from across Africa. This way we will unite to amplify the true pan-African story. Previous ArticleAfrica’s Economic Future – How bright?